Renault has released official pictures and information of the 2009 Renault Megane, set to debut at this year's Paris Motor Show, thus assuring that no more French car magazines will be shut down for publishing photos of the new hatch. The company plans to release six different versions of the Megane by 2010, including a range of environmentally friendly diesel options that come in below the 120g/km C02 mark. Press release below the jump. NEW RENAULT MÉGANE ALLURING, INTUITIVE AND REASSURING New Renault Mégane's lines are the product of a desire to produce an immediately eye- catching car. Its dynamic, elegant styling takes its inspiration from the passion associated with the automobile, including cues from the world of sport. New Renault Mégane is robust, too, with the accent very much on the fit and finish of its panels, as well as on that of the materials it employs. The new model has also benefited from the progress that has been achieved across the Renault range on both the reliability and durability fronts. New Renault Mégane's interior is extensively equipped with practical, comfort-enhancing features. These include combined analogue/digital instruments incorporating a new, easier to read colour-coded cruise control/speed limiter interface. The list continues with a host of equipment normally associated with the next segment up, such as hands-free entry and ignition, automatic locking as the driver walks away from the car, a Carminat Bluetooth® DVD navigation system and a custom-developed audio system (3D Sound by Arkamys®). New Renault Mégane's on-road performance lives up every bit to the high standard promised by its looks, with precision, control and efficiency combining to deliver a particularly enjoyable and reassuring ride. A broad, extensively renewed range of dCi and TCe powerplants combining performance and respect for the environment is available, with four diesel engines that can claim CO2 emissions equal to, or less than, 120g/km. New Renault Mégane has been designed to offer best-in-class safety performance, too. Features include double side impact sensors and dual-chamber airbags as seen on Laguna III and aimed at minimizing the consequences of a side-on collision. It is also a socially responsible vehicle which is 95 per cent end-of-life recoverable by weight, while almost 12 per cent of the plastics it contains are sourced from recycling, equivalent to an average of 22kg per car. 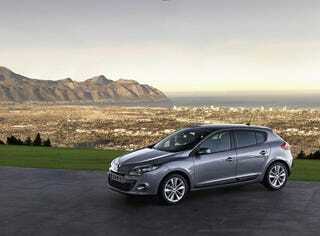 New Renault Mégane marks the beginning of Renault's renewal of its C-segment line-up. With market share of more than a third, this segment has long been the biggest in Western Europe and makes a significant contribution to Renault's performance in terms of both volume and profitability. By 2010, the New Mégane family will include six different models, each of which will have its own distinct and assertive personality. These six models have been conceived essentially for customers in European markets and will be manufactured in Palencia (Spain) and Douai (France). Other models will be available in non-European markets equipped with specific technical solutions suited to local conditions of use. For almost two years, Renault's design and engineering teams focused their attention on three main areas of development, namely reinforcing the personality of each member of the Mégane line-up, ensuring a balanced offer in terms of performance and equipment, and targeting best-in-class positioning for all of its key features. New Renault Mégane, which goes on sale from November 2008, comes after the 15th car of the Renault Commitment 2009 plan and consequently benefits fully from the progress achieved in terms of quality on preceding models.